2010 is coming to an end. A lot learned. New friendships made, old ones deepened. I joined quilting Bees, made some amazing friends, my creativity expanded, I began to explore more. Mistakes were made, but I've learned from them. It was a year that felt like a new chapter in many ways. For 2011 there are new plans, new things I want to try and things I want to learn to do better. I'd like to get back into handwork, doing applique and quilting by hand. Of course, I'll be working hard to continue to finish UFO's and "making do" with the stash I already have. Most importantly I've really begun to see the pleasures of "the process" and not worrying about the finish line. That is something I really want to work on, enjoying and getting better at my crafts every step of the way. To all who visit my blog, thank you so much for your encouraging words! This blogging community is so wonderful and kind. I wish you all a wonderful 2011 filled with goodness, laughter, good health and lots of creativity! Hi Heidi! Nothing is more important than the road we travel even with needle and thread. Slowing down to enjoy the stitching or quilting makes us richer. I did not accomplish nearly as much this past year but feel more satisfied than ever. It has been a year of quality. Sounds like yours has too. I plan to set another goal this year though to complete more of my UFOs. There is just too much wonderful stuff out there and you get to where you want to do it all but never can. You have accomplished much, and your goals to learn are great! Happy New Year! 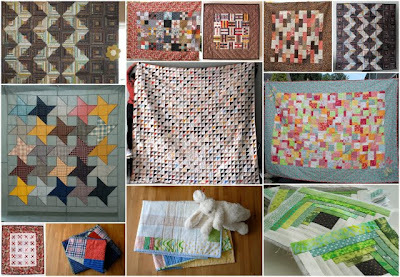 Love the way you did so many "stash" quilts...hope you have put a big dent in using it up.